Top 6 Blood Pressure Monitors Review - Sit. Stay. Forever. We’ve compiled a list of the best home blood pressure monitoring systems. These blood pressure monitors have been tested in the field, at multiple community blood pressure screenings. As a registered nurse, I can personally vouch for each model reviewed. In addition, patients on home health visits have vouched for these home blood pressure monitoring devices. You can take this advice, and chose the best one for you to use in your own home. In this article, we will review eight blood pressure monitors available for purchase for home use. We will not look at wrist blood pressure monitoring devices. They haven’t proved to be as accurate as models that fit on the upper arm. The American Heart Association recommends that blood pressure monitors for home monitoring use are most accurate when the cuff fits around the upper arm area. With that said, when you monitor your own blood pressure, you should make sure to perform blood pressure readings in consultation with your doctor or primary care provider. They will know what to do to adjust your medication. Leave the adjustment of your blood pressure medication to your health care provider. Why home self-monitoring of blood pressure when you have diabetes? Also, your doctor may have recommended that you monitor your blood pressure when you are at home. This way, you will be able to pick up on any elevations in blood pressure that your doctor may need to know about. Your insurance company may or may not pay for a home blood pressure monitoring device. Most Medicare plans do cover a home blood pressure device with a doctor or health care provider’s prescription. There are several national programs that you may find in your community that offer programs that provide you with a blood pressure monitor. One is Check, Change, Control, by the American Heart Association. To find a Check, Change, Control class near you, visit heart.org. Knowing your own blood pressure number is important. If you check it at home yourself, you will always have a chance to change it, and then you can get it in control. You may need to increase your exercise, decrease your salt intake, look for hidden salt in your foods and eliminate them, or have a talk with your doctor about increasing your blood pressure medication. If your blood pressure is severely elevated, then you will know when you may need emergency attention for your blood pressure. What are some great features to look for when buying a home blood pressure monitoring device? When your blood pressure meter can be uploaded straight to your electronic medical record (EMR), it allows your doctor or health care provider to see your readings in real time. Look for a blood pressure monitoring device that has this capability. The cheaper machines just didn’t make the cut, although there is one simple Omron machine that we recommend that comes in a bit less at around $44, and one of our picks comes in at a low $22. For the most part, the mid-range price and up is a good choice, but look for features that you require, such as ease of use, or techy bells and whistles, if that’s what you’re into. The blood pressure monitoring devices on our list have all been extensively tested in the field, at community health fairs and against manual readings by a registered nurse. The monitoring devices were tested multiple times on men and women, in the correct position for blood pressure readings. The registered nurse then manually tested the subject’s blood pressure with a stethoscope and a sphygmomanometer. Measurements from the machine versus the manual reading were compared for accuracy. All models were tested multiple times on both men and women in the community health field. Great machine, and we love the cuff. It needs to be calibrated, but when this is done, results will be accurate based on our field testing. Share your data with your provider that you store on your device. All in all, Omron 10 is our top pick. Our least expensive pick, but a great device when you don’t mind having no “bells and whistles.” You will get accurate results for little cost. Only get this machine if you are technologically up-to-date. If you fumble with tech, pick one of our other choices here. For those who like tech, it’s a dream. Everyone knows and respects the name Panasonic. It’s a tough machine, with a good accuracy rating, and it won’t break the bank. The cuff has a clip, but we didn’t have any trouble with it in the field testing. This device is for the tech enthusiast. We don’t recommend you get one for your aunt who doesn’t have a smartphone, because it works with a smartphone and app. We like the Omron for its ease of use, the cuff that is easy to manage and fits most every arm, and its reliability to check and check blood pressures all day long. This one will store and share, for a little less money than the Omron 10. Pros:Doctors and clinician preferred. Easy, cuff is great, share data and store it, ease of use Pros:Accuracy, ease, FDA approved, stores data for 4 people Pros:For Bluetooth connectivity to your devices, it goes with iPhone or Android. Pros:Easy to see monitor. Cuff is easy to adjust, and fits most arms well. Medium priced. Pros:Great for the tech enthusiast. Not too hard to use the app. Neat graphs and charts. Pros:Easy machine, great cuff. Display easy to read. You can still store and share data on it like the Omron 10 -cost less. Cons:It’s not techy, but it’s a tough machine. It’s our top pick for the all around device, so no cons. Cons:No fancy features, but still has a few bells and whistles, no adapter Cons:Not tech savvy, must have Apple or Android. The most expensive model. Cons:Accuracy is a little less than some, but it came in at about 1-3 mm/Hg difference from our manual tests. Cons:Price is higher than some. Not for you if you don’t have and operate a smartphone and apps. Cons:Not many bells and whistles, but it’s all you need in a blood pressure device. The thing will hit the floor and work. On our list, we picked the blood pressure monitoring devices that were the most accurate in the field. We chose the ones that gave us an “error” code less often, as well as providing a near perfect match to the person’s blood pressure which we obtained manually. 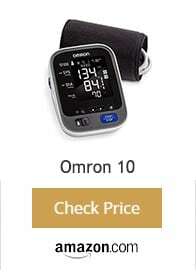 The Omron 10 Wireless Upper Arm Blood Pressure Monitor is by far our favorite choice. It provided near perfect match accuracy to our manual readings. It rarely gave us an “error” message. Error messages only occurred when batteries were running low, and resolved once new batteries were replaced in the device. It’s got Bluetooth and comes with a smartphone app. It will store your blood pressure and heart rate data. You can pull up your history, and share it with your health care provider in your electronic medical record. Lights on the monitor screen indicate when your blood pressure is too high, or within the normal range. The memory is greater in this model than in other competitive models. Two people can store separate data, so your spouse could also keep track of their blood pressure. There is enough room to hold up to 200 blood pressure readings, or for two people, the device holds data for 100 readings each. The Omron 10 is super easy to assemble and operate. You only need to insert batteries into the bottom of the machine, and plug the blood pressure cuff into the side of the device. Once placed in the correct position on the subject’s arm, the large blue “start/stop” button is pressed. This begins inflation of the cuff on the subject’s arm as the numbers on the display rise. Once inflated, the air is let out, and the numbers start to go down. They will stop at the blood pressure and heart rate reading for the subject. Directions included give a “Quick Start” option, and are easy to follow with photographs to clarify setup. Anyone can check their blood pressure using the Omron 10, and track their blood pressure, as well as share their results with their physicians. The Omron 10 came within one to two mm/Hg difference between manual and device testing. That’s close, so we were pleased with the accuracy that it achieved in the field. The Omron 10 was our favorite in the field. It’s ease of use, testing accuracy, and ability of the cuff to fit almost any arm we tried it on made it our favorite. Although we didn’t use the free app that comes with it or the Bluetooth connectivity at our community screenings, we see how those features are important for the person who is trying to monitor their blood pressure. All of this combined, and a price that is affordable, the Omron 10 is sold for $64.67. Another great machine is the LotFancy blood pressure monitor. Its large display is great for those who have less than 20/20 vision, as do many people with diabetes. That’s what gives this device the highest marks, along with the low price. How easy were the instructions to follow, and how easy was the product to assemble? It’s easy to set up, get and obtain a blood pressure reading, and is like the Omron 10 in that respect. However, a negative with this blood pressure monitoring device is that it has a cumbersome and hard to work with cuff. We got within 5 mm/Hg on our readings in the field. It was somewhat less accurate than some of our other machines that we reviewed, but it still gives a reading that will hold up to what your nurse or doctor gets when they manually check your blood pressure. The LotFancy device has an alert for problems with your heart rate, and it has the capacity to record and track blood pressures for up to four people at once in separate data files. It gives an average of three previous readings. It’s FDA approved, so your insurance company is likely to cover it if they cover blood pressure monitoring devices. Check with your individual company and plan for coverage in this area. In the picture below, you see the metal clip to the right of the cuff. We love how the method of applying the cuff to the arm is detailed in the description, and there is really no way you could go wrong with the placement of the cuff. It’s a pain to adjust the metal clip. It gets stuck, and you end up letting the cuff out more than you meant to, having to take it off the arm, rethread it through the metal clip, and start over. Once you get used to the cuff, you can work with it, but it’s not our favorite. Still, if you have poor vision, you will love the display, even if you have to wrestle with the cuff some. It will alarm if your heart rate is not regular at about 25% above the normal range. How much does the LotFancy cost? At a mere $22.48, the LotFancy is the least expensive option with fairly accurate measurements. It’s a simple machine that anyone can operate, with not too many bells and whistles. For the price and simplicity, we give it two thumbs up. Another great blood pressure monitoring device has compatibility with your Apple or Android device. We liked it just as much as the Omron 10, but found the cuff a little bit cumbersome to work with and folks who don’t like tech and don’t have smartphones probably won’t like it. That’s why it came in at No. Bluetooth on this blood pressure device transmits data to your iPhone, Apple table or notebook, or to your Android devices. 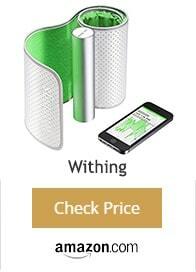 The Withings Health Mate App links with wireless connectivity and comes free with the set-up. All data is stored in a cloud, so you need to be somewhat tech savvy to operate this device’s advanced features, and to share your data with your health care provider. How easy were the instructions to follow, and how easy was the Withings monitor to assemble? Set up instructions are easy to follow. Your cellphone will be used for your display while checking blood pressure. This is also where your data will be accessed from your cloud. If you have trouble with new technologies, a younger relative is usually a good choice for setting these devices up the first time when you are uncomfortable with setting up new Apps. How accurate was the Withings monitoring device? We found that we got similar readings on the Withings as opposed to our Omron 10. On occasion, the difference in the accuracy of the two was that the Withings sometimes read up to 3 mm/Hg difference, which was a slight increase over the Omron 10. All in all, a good machine if you like tech. Some other great features with this machine is that it compares your readings with the standards for the World Health Organization (WHO). It’s completely wireless with Bluetooth connectivity, and allows for multiple users with separate data files. You’ll love it if you are a techy. If you’re not into tech, you probably won’t like the Withings device. For those who know their way around their cell phones, and in and out of “clouds,” this device shouldn’t be a problem for you from the beginning. Those that have more difficulty with new technology will find it easy to use once the initial set-up is complete. The App works in different languages, and it’s easy to connect with your EMR. How much does the Withings cost? The Withings Blood Pressure Monitor is the most expensive monitor that we recommend. The price is $165.99. It may be that your insurance covers one, and then you may be able to get a Withings. If you like your smartphone and you carry it with you and rely on it for other things, you may find the Withings well worth the extra money. At any rate, it’s an accurate machine with some great features for the tech enthusiast. The Panasonic company makes a good blood pressure machine. It shines out as a great performer in our field tests, and people at blood pressure screenings like the display. They will ask what the numbers mean, and it’s a basic set-up, with no major technical operations to worry about. How accurate is the Panasonic? In our field testing, the Panasonic came between 1 and 3 mm/Hg of our manual blood pressure testing. It was just as accurate as the Omron 10. The Panasonic blood pressure monitoring machine is simple. It will alarm to tell you when your blood pressure is too high or too low, and it collects data in it’s memory automatically. With the touch of one button, you will get accurate readings. The cuff is just fine for maneuvering the arm and positioning. The large, bright display is easy to read and presented in a landscape read out. We got many errors in the field. We changed the batteries several times through the course of several blood pressure screenings, but the errors continued. This often occurred with subjects weighing over 250 pounds. The cuff may be a little too small for a person who requires an extra large blood pressure cuff. For this reason, the Panasonic device scored a bit lower than some other models. 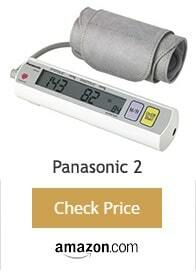 How much does the Panasonic Upper Arm Blood Pressure Monitor cost? 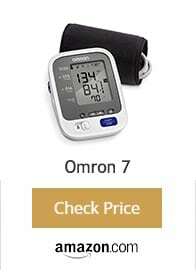 The price for the Panasonic Blood Pressure Monitoring system costs between 60.99 and 67.73 on Amazon, but we found it on sale for 52.95, also on Amazon. 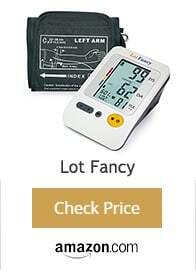 Welch Allyn Home Blood Pressure monitor is a great choice, though it is costly when compared with some of our other top picks. We used the professional version of the Welch-Allyn machines in clinics where I worked for years, so I can vouch for this company and their machines. They are accurate, but the price makes it come in a little lower on the list. How accurate is the Welch Allyn Blood Pressure Monitoring device? I would have to say after multiple testing in the field, that this machine is dead on accurate. I haven’t had a reading more than one mm/Hg above or below my manual readings in the field. The price is at the moment the only set back, but if your insurance covers it, go for it. The Welch Allyn brand is chosen most often by doctors and other health care providers for blood pressure measurement. You may pay more, but you will get an accurate machine that will work for years. It’s simple with only one button being necessary to push in order to operate the device. It has a free smartphone App and wireless Bluetooth connectivity, so readings may be shared with your health care team. If the over inflation of the cuff causes you discomfort, this device pumps up and down in 20 seconds, easing discomfort related to blood pressure screenings. If you want the clinic in your home, this is the machine for you. Check on your insurance coverage so you don’t have to pay out-of-pocket. 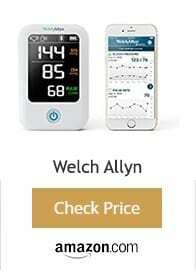 How much does the Welch Allyn blood pressure monitor cost? The cost is a little on the high side at $99.99, which is what brings it down on our list. There are not many other cuffs that can match it in accuracy. What else was a negative with the Welch Allyn device? Other than the price being high, we didn’t like the cuff as well as some of the other models we reviewed. Again, with a metal clip, it was a bit aggravating. That may just be our personal preference. You may like the metal clip just fine. We like the Omron 7 for it’s reasonable price, ease of use, and we have had to face that we do like Omron cuffs the best of any on the market. Other than the Welch Allyn, you can’t beat Omron models for affordability, price, ease of use, and accuracy. How accurate is the Omron 7? It’s accurate within 1-2 mm/Hg in our field tests. Just because a blood pressure monitoring device hasn’t got as many bells and whistles as some, and doesn’t have Bluetooth and wireless capabilities, doesn’t make it any less accurate than the others home monitors. It’s just a matter of preference as to whether you want the extra tech features with some of the other models reviewed. The Omron 7 has what the manufacturer calls “Advanced Accuracy.” We agree, because it’s just about dead on the money with our manual readings. Green indicator light shows a normal range, while orange indicates high blood pressure. A reading level bar indicates your blood pressure next to established normal ranges. We are not overestimating how much we love the Omron cuff. It’s a comfort fit cuff, and it resists pinching while a person’s blood pressure is being screened. The machine works fast, which is great for our screening purposes when the lines are 30 people deep. Two users can track up to 60 blood pressure readings each, stored in separate files in memory. It will check three readings at once, and give you an average, which is a recommendation by the American Heart Association when performing home blood pressure readings. How much does the Omron 7 cost? The device costs $50.99 on Amazon. There is a free App that comes with it for data, and you can share it with your provider. Now that you have some idea of the model you want to purchase, there are a few things that you should know in order to check your blood pressure accurately at home. Avoid alcohol, food, caffeine, cigarettes, physical activity or taking a warm bath or shower for at least thirty minutes before you measure your blood pressure. If you’re nervous, take a short rest and try to calm down. Anxiety and stress will increase your blood pressure and your top number (systolic blood pressure) may be elevated. Perform your blood pressure measurements at the same time each day. Make sure you are seated comfortably in a chair near a table where you can rest your arm. The kitchen table works well. While keeping your feet flat on the floor, position your cuff per the instructions with your monitor on your upper arm, and rest your upper arm on the surface of the table. You should keep your palm facing up, which helps to align the arrow on the cuff with your artery. Push the start button and hold still. It’s best not to talk or move, but rather breathe normally. Take down three different readings per day. You can use a calculator to figure out your average reading. Then you can store and share the data with your doctor or health care provider if you chose a monitor with this feature. Otherwise, write the numbers down and take them with you to your doctor. If your numbers are too high, call and speak with the nurse for the practice. Make sure to take your blood pressure medication as ordered, and don’t change your own doses. Remember that your blood pressure will fluctuate from day to day. At my blood pressure screenings, ladies come in rushing to get to their yoga class, and they would like me to check their blood pressure. I tell them I’ll check it when they are finished with their yoga class, but if they insist, I’ll check it. We often find that their blood pressure is much higher on the top or systolic number due to their anxiety from running around and rushing to get to class. After class, when we check their blood pressure again, the top number will have come down after the calming effect of the yoga class. Similarly, some people get what is known as “white coat syndrome.” This is when the mere sight of a medical professional runs their blood pressure up. This can account for why your blood pressure is fine at home, but sky high when you see your doctor. If you are very small or very large, your reading might not be as accurate if your cuff is sized wrong. Get a monitor with an adjustable cuff in this case. We hope our reviews help you to find the right blood pressure monitor out there. There are many good monitors on the market, but this is a list of what we consider to be the best. Let us know if you got your home blood pressure monitor, and how it worked out. Are you better able to manage your blood pressure now that you check it at home? Let us know in the comments section below.